This article does not deal with the Mercedes 170V, built from 1945 till 1953, but the successor, the Mercedes 170 S, built from 1949 till 1955. 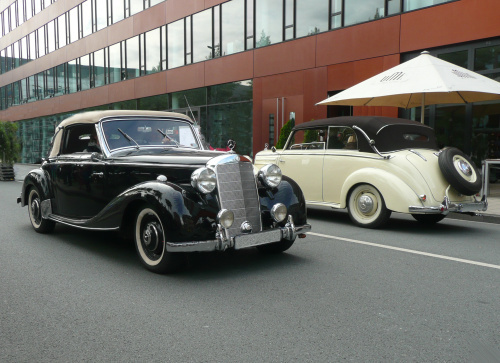 It is interesting that a Mercedes 170, once thought to be for the upper middle-class prior to World War II, has developed in Germany into a car for the rich after the war. But those were trying times and the upper middle-class just could not afford these cars at the end of the 1940s anymore. They either had older pre-war automobiles or new 1.2 l Ford or Opel. 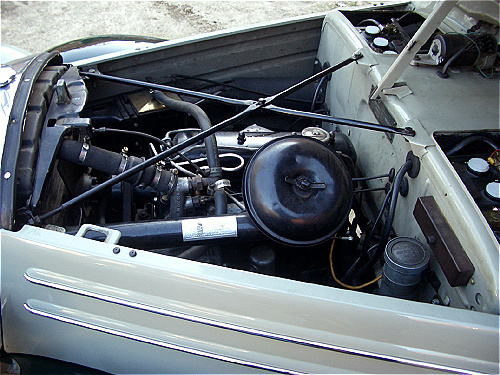 The rich usually bought an Opel Kapitän, which used a six-cylinder power-plant and could be purchased for 9,950. – DM ($ 2,360. – at 1950s exchange rate). It had in those days a huge sales lead over the four-cylinder Mercedes 170S, which had a price tag of 10,100. – DM ($ 2,400. -) at its introduction in 1949. That type of investment bought you in those days an eight-cylinder Packard in the US. Mercedes could not offer a six-cylinder yet, because the necessary tooling had not survived the war and money for new equipment was scarce so shortly after the war. So the Mercedes 170 S, just like its predecessor, was Daimler-Benz’ answer to the Kapitän. It had to be sold in sufficient quantities to allow developing more modern engines and buy badly needed machinery. 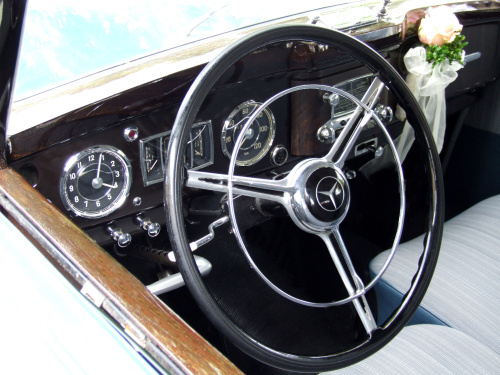 Given its high price and banking on its quality and the good image the company enjoyed, the Mercedes 170 S was seen as a luxury vehicle. And aided by the press, the four-cylinder car filled that role remarkably well. 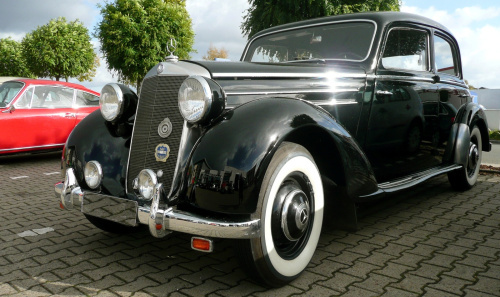 That it was not such a popular seller as its main rival was for Daimler-Benz not a real issue. Next to improving their immediate financial situation, the company’s medium term planning was to get a firm grip on the luxury car market. Although they did look into the lower priced car market too (W122), their real expertise was the upper middle class and luxury car market. And the Mercedes 170 S was just the first, but vital step in that direction. An important image boost came from the arrival of two elegant convertibles, the two-seater Cabriolet A and the four-seater Cabriolet B. 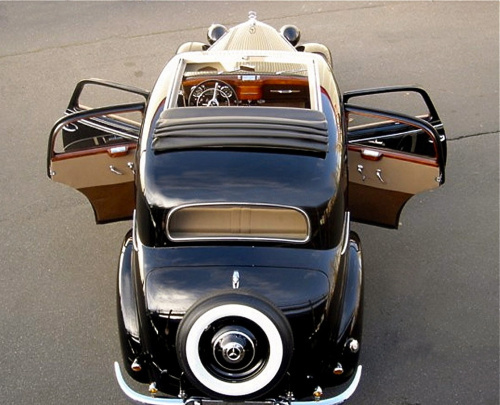 They were built by hand and in keeping with its pre-war tradition, the Cabriolet A even had a wooden body structure. All chrome applications on these special cars were made of solid brass, hand fitted first, adjusted and only then chromed. 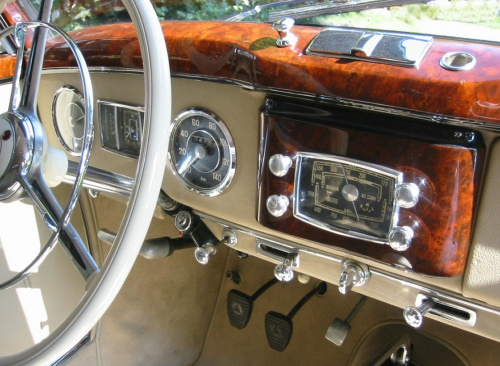 The dashboard’s top was covered with solid wood, with the same wood on the window sills and in the center of the dashboard. Although the standard sedan had the same areas covered with wood, the one on the cabriolets and here especially the Cabriolet A, had a different, much richer looking veneer. One could choose between walnut and bur walnut veneer. Other options were available on request, but almost never ordered. 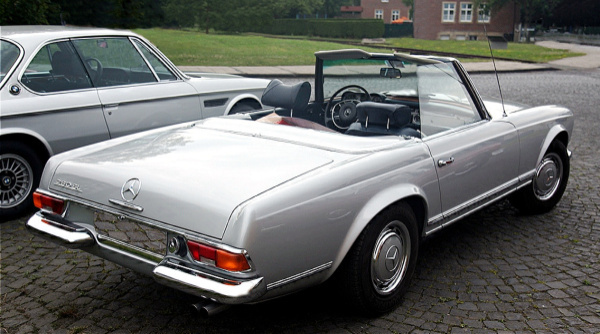 Although both Mercedes-Benz cabriolets had a price tag that made them the most expensive German cars until the arrival of the six-cylinder 220 models, it is doubtful that Daimler-Benz made any money with them. Daimler-Benz continued its tradition of offering a diesel version. 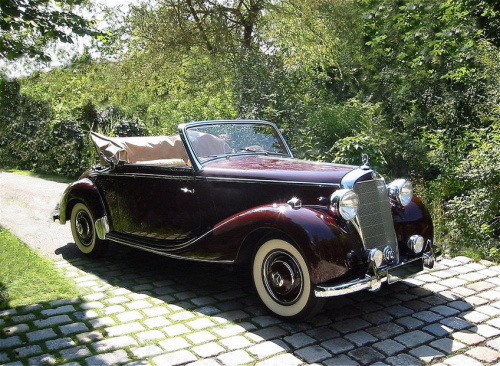 It became available to the public in 1952 and was known as Mercedes 170 DS. It was the same engine that powered already the previous 170 V. A rather frugal and noisy affair, it destroyed somewhat the luxury image of the 170S. Management was of course aware of this. They had wisely decided to hold the introduction back (and keep offering the old 170V as diesel) well after the new six-cylinder 220 had arrived. That way the role of executive transportation had shifted to the newer model and the “older” 170S remained popular with people, who had a keen eye for quality in an economical package. The diesel engine produced 40 horse-powers at 3,200 rpm, which resulted in a top speed of 105 km/h (65 mph). 40 hp for a car weighting some 1.2 tons was nothing to be too excited about, but customers did not mind. The least thing they expected from their diesel was to break any speed records. When the more modern looking 180 ponton was introduced in 1953, the styling of the Mercedes 170 looked clearly pretty dated. 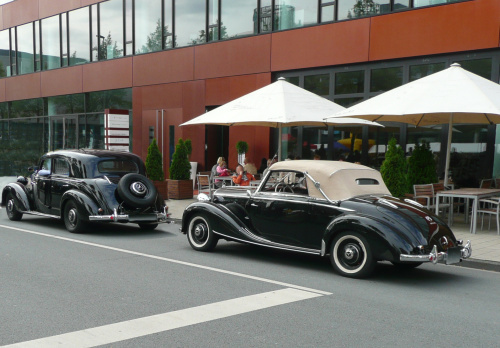 But as Daimler-Benz had decreased its price, the diesel version continued to remain popular. They still saw in it a reliable alternative to the 180. It did not sell as many units as the more modern alternative of course, but it outsold its equally available petrol sibling in 1954, its last full year of production, almost eight to one. While 15,532 units of the new 180D were sold in 1954, some 5,992 units of the Mercedes 170 S-D found a buyer. That was just 742 units shy from its best sales year 1952. Not bad for a design that had its roots back in the mid 1930s. 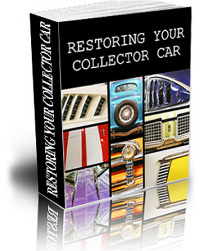 If you want to read much more about the Mercedes 170 and the other Mercedes models of the early 1950s, all of that is covered in my books and e-books and can be ordered from my website. They offer next to the cars’ history the experience to own one of these great vehicles and have plenty of color pictures, most of which have never been published in a book before. I am sure you will enjoy. you have very beautiful photo about mercedes-ben. i have a classic 190 model 1962.i love it and i love mercedes.but i cant buy this expensive models. but i wish to have some one. i invite you to com to north of iran at the caspian sea beach to my home.i so happy if you come to me and see my car my friend.